Bookings are now open for our Whitsun Half-Term Soccer Schools, including our new venue at Queensgate Primary School, Bramhall. Read more and download the Application Form, for further information give the team a call on 0161 286 8888 (option 3). Read more about how our Sport In Memories Wellbeing Project continues to grow! Bookings are now open for our Easter Half-Term Soccer School, read more and download the Application Form. For further information give the team a call on 0161 286 8888 (option 3). 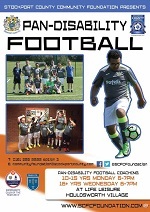 Read more about how we have once more teamed up with Equity Foundation in delivering Free football sessions. Read more about our fantastic February Half-Term Programme 2019. Read more about how we have once-more teamed up with Stockport Homes and Equity Foundation in delivering Free Soccer Sessions during the February Half-Term. February Half-Term Soccer School 2019 Is Now Open For Bookings! Bookings are now open for our February Half-Term Soccer School, read more and download the Application Form. For further information give the team a call on 0161 286 8888 (option 3). Read more about our Premier League Primary Stars Programme. 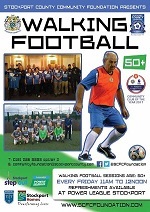 Welcome to the Stockport County Community Sports & Education Foundation website. Hopefully when browsing the pages of our site, you will gain an insight into the grassroots work we do in our community and yours. As a charity the Community Foundation is always looking for ways to help fund the work we do and link up with local companies and organisations. If you would like to know ways you can get involved please contact us here. We are now offering Banners adverts on this website for companies to advertise and increase their Search Engine ranking for more details click here.